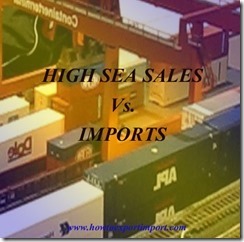 What is the difference between High sea sales and imports? Imports and High sea sale - a comparative study. How imports differs from high sea sale. What are the major changes in high sea sale than regular import? What are the procedures for high sea sale? How to differentiate High sea sale between Imports? What is High Sea Sale? If a buyer wants to sell his consignment to a third party before arrival of goods but after sailing vessel from load port, such sale is known as high sea sale. In simple words, the ownership of goods is transferred, when goods are on transit. Imports means any goods moved in to a country from foreign country. A couple of detailed articles about imports and exports, its meaning etc. may be read in same website for further understanding. You may also read other articles about high sea sale in this website to have a clear idea about high sea sale business. Would you like to share your experience about this subject – Difference between high sea sale and imports? 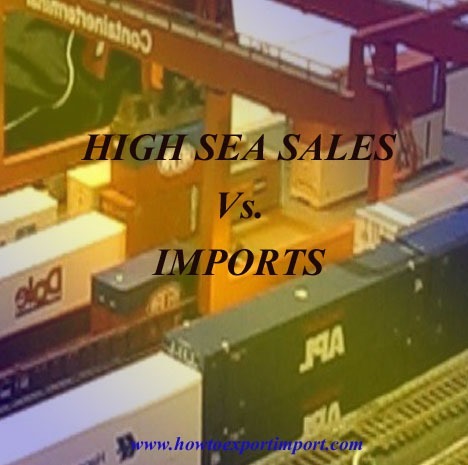 Comment below your thoughts about difference between High sea sale and Imports. Mayank Khanna: On 16 May 2013 Can you please clarify if we do a High Sea Sale, who should be shown as the supplier on bill of entry? Although the customs is calculated on the local invoice value, why is it necessary to account for the original shipping invoice as well? Who'll be the supplier if we do double or more high sea sale of the same consignment? Is there any way to hide the original supplier's details as revealing once may be the business lost forever? Tushar Mathur: On 29 June 2013 Sir May I get the list of documents when there is double High seas sale consignment and also confirm the actual CIF value for actual HSS buyer ? Glintson Zimik: On 03 January 2014 Dear Sir/Madam, could you please clarify if we do a High Sea Sale, is it mandatory to show/disclose the original commercial invoice value/foreign invoice value while filing the bill of entry? Is there any provision where only total local invoice value/HSS invoice value would be taken in the bill of entry - BE. Is there any provision to hide the original commercial invoice value/foreign invoice value while filing the bill of entry - BE. This is vital for a HSS Seller as Bill of Entry - BE have to be given to the HSS Buyer as they would be claiming refund/MODVAT. And revealing the original invoice value to the HSS Buyer once may be business lost forever. G.P. NAIR: On 12 February 2014 In High Sea Sales, can we raise the sales invoice at zero value? Is there any rule regarding the value of the sales invoice? Lokesh B: On 12 March 2014 Hi, Can you pls confirm the difference between High Sea Sale & Merchating Trade? Is both same? NARINDER : On 17 June 2014 WHAT IF the purchase/sale is outside of india, goods not destined to india, is direct sale from seller to buyer, but pmt isa made from india and recd in india on account of sale ( merchandise sale ) is it neceassary to register in vat deptt. N.C.DAS: On 06 November 2014 How to discharge the obligations against import of goods though goods is not reached in India.what documents to be submitted in place of Bill of Entry which is geerated by Custom Authority. Whether any tri-party agreement is required? If so how to hide the name of the party from whom goods are imported. How to send the remittance to the party from whom import is effected before receiving the payment against export. Can you clarify? S.G.Kulkarni: On 25 November 2014 In High Sea Sales, the seller sells the goods to buyer and the seller arranges Bank transfer order. In such scenario, this falls under BAS[business auxiliary service] and attracts service tax. Recently, CESTAT has given stay for pre-deposit. Final decision/outcome is yet to come. In my opinion, this may attract service tax. It is suggested that the seller should charge service tax while carrying out High Sea Sales, as the matter is not free from doubt! Kedar: On 07 September 2015 Can the High Sea sale be predetermined? CA Gaurang Goyal: On 15 October 2015 Just got to know your reference through one online information portal. I have a question regarding high sea sales. We had imported dry fruit to India, but sold the same to an Indian Buyer Co. on High Sea Sales basis. The HSS Buyer company wish to re export the same after processing these goods. Can the refund of duty/drawback will be available to the HSS buyer likewise in a case of original importer. SUMIT: On 09 March 2016 Can we make such high sea sales to a third country? Ketan Shah: On 10 August 2016 I was just going thru your various articles on High Sea Sales from the website howtoexportimport If I order a consignment to a Supplier “X” from Germany and I enter into High Sea Sale Agreement with an Indian Customer for a consideration in INR, can my Indian Customer ask me to deliver the Goods to the port of Vietnam instead of India? If yes, what can be the need of documentation after HSS Agreement.? Is there any better procedure by which I can Order directly to the German Supplier to deliver the Goods to Vietnam on behalf of my Indian Customer? M Ramesh : On 16 August 2016 I regularly follow your site and I am very much happy for your responses and I am much thankful for your responses. I have 1 doubt i.e. when we are doing High Sea Sale the consignment is received in partial in this case how to proceed and how to prepare the documentation? Original scenario is recently we purchased 200 systems in this we received 180 systems in 1st slot and after 4 days we received the remaining consignment in this case how to prepare the HSS documentation and how to proceed and how to mention the Air way bill number. We are receiving through air mode. kindly please advise on this and your opinion is very much helpful to me. Shyam: On 21 November 2016 I am interested in knowing procedure involved in excuting a Hisea Sale.I am looking for a in-depth advice in this matter from an expert. Shyam Sundar Nalluraya : On 10 March 2017 I am interested in knowing procedure involved in excuting a Hisea Sale. I am looking for a in-depth advice in this matter from an expert. Can you please share your contact details so that I can get in touch with you. Warm regards, Shyam. Krishnan Yegnaraman : On 10 March 2017 Dear Sir I got your mail address from the Internet . I need a small clarification on HSS . How do we know that the goods have left the territorial waters of the exporter in order to enter into HSS agreement ? In my opinion ,bill of lading date cannot be taken since the goods may still be at the port awaiting clearance .Pls clarify . Sunny Kumar Soni: On 19 August 2017 Please elaborate that if a company registered in india wants to buy goods from a wholesaler in dubai and then sell the to the retailers/other wholesaler in dubai itself, how can we do that?